You can see 4 chimneys looking in the direction of Bedford, the site of the Stewartby brickworks. We will get quite close to the chimneys and have a view of the brick making kilns. 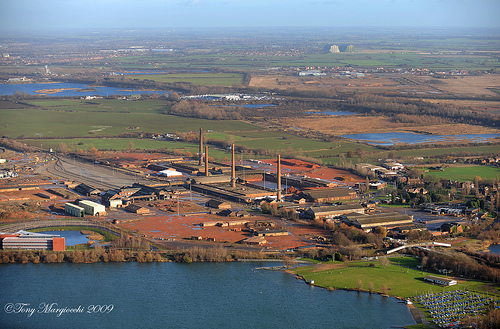 Stewartby was once the largest in the world employing 4,000 people producing 18 million bricks a week. It’s now redundant, leaving a model village (a village built by the industrialists to house their workers). The walk will mainly be on flat hard well-drained surfaces but soft and wet underfoot for the first and last parts. Stewartby Brickworks to Cardington Airship Sheds. 2009. By Tony Margiocchi (Snapperz). Meal provided? : Please ensure you bring a packed lunch. Gear: Comfortable clothes and footwear, better hiking boots because the path may be muddy, and waterproof clothing. Always carry some water with you. This entry was posted in Local walk, News, Past events, Walks and tagged bedford, brick, chimneys, kiln, stewartby.